Following the path of Jesus can drive you crazy. I pray impatience with the Gospel is not a deadly sin! While we may not necessarily want to skip the journey, and get to the destination, we at least would like to move ahead on our spiritual path. Lord, each week, inch by inch, the church doles out only a tiny snippet of the story of Jesus on the way to Jerusalem. Each week we preach and hear the Gospel a paragraph at a time. Sometimes it is excruciatingly slow. This section of the Gospel of Luke is called, “The Journey”. It begins in the 9th chapter after the transfiguration when Jesus has “his eyes set on Jerusalem”. It continues until the 19th chapter of Luke with the triumphant entry into the Jerusalem. These 10 chapters take months to read a paragraph at a time. It took Jesus months as well, even though he could have traversed that amount of territory in a couple of weeks, easy. Months after the transfiguration we find we are still wandering with Jesus right outside Jerusalem in Jericho. He may have had his eyes set on Jerusalem but his heart is sidetracked feeding, healing, teaching, and praying. His disciples tried to keep him moving. Right after the Gospel this morning they rebuke parents for bringing their infants to Jesus, but Jesus lets all the children come anyway. He spends time visiting Pharisees, tax collectors, healing lepers, telling parables and debating in the synagogues and streets. And those are just the events they recorded. The image of a map with a hundred dotted lines going every which way indicating all the detours gives us a picture of what on the way may mean. On the way he is slowly and patiently teaching his disciples. At the beginning of the 12th Chapter the very first words to his little flock are, “meanwhile”. That is the part that undoes me. Meanwhile, while we preach a paragraph at a time, meanwhile, while we take up one more collection, meanwhile we eat a bite of bread and take a sip of wine. Meanwhile, the world is burning for his message of radical love, the war is four and half years old, the number of people below the poverty level in America is on the rise, and the Nobel Prize has been given in recognition of the crisis of global warming. Meanwhile, he is within fifty miles of Jerusalem in an occupied nation in which people are being persecuted. Meanwhile he takes his own sweet time saying, don’t worry about tomorrow, give everything away, give thanks and watch and wait. Meanwhile, two Sudanese women walked into my office. I had scheduled forty-five minutes for their meeting. They began the meeting by thanking me for my time, my precious time. Then they told me the journey part of their story. They had been on a long and arduous journey from a long and bloody war that created an entire generation of refuges. They told the story of the death of most of their family, their village being ruined, being separated from their siblings and friends since their childhood in the late 1980’s, fleeing to Egypt and the brutality they faced, the process of becoming refuges and arriving in Nashville in 2000. Finally they are here and safe with their own children. They are now feeling called to return to their hometown and build a school for the orphans of war. They had their eyes set on freedom on a journey that took them 10 years; a journey that should only take a day by plane. They get here and begin to get established. But in their great humility, they were sitting in my office with beautiful thick accents saying they wanted to turn around and go back and help. They said that God had been merciful to them and this was an expression of their gratitude. The Gospel message came flooding past my pharisaical mind and I could hear the words, “God have mercy on me, a sinner. God forgive my arrogance and impatience. God make hear the cry of others so that I don’t worry if I ever make it to Jerusalem.” These two young women wanted to go back, register themselves as a new organization and get some land for their fellow pilgrims in need. Having been given mercy from the war, they needed to make meaning out of all the suffering. The scars on their legs are reminders we can’t walk fast enough to get away from the pain. We worked on their journey and how to begin to plan for a school when they return. 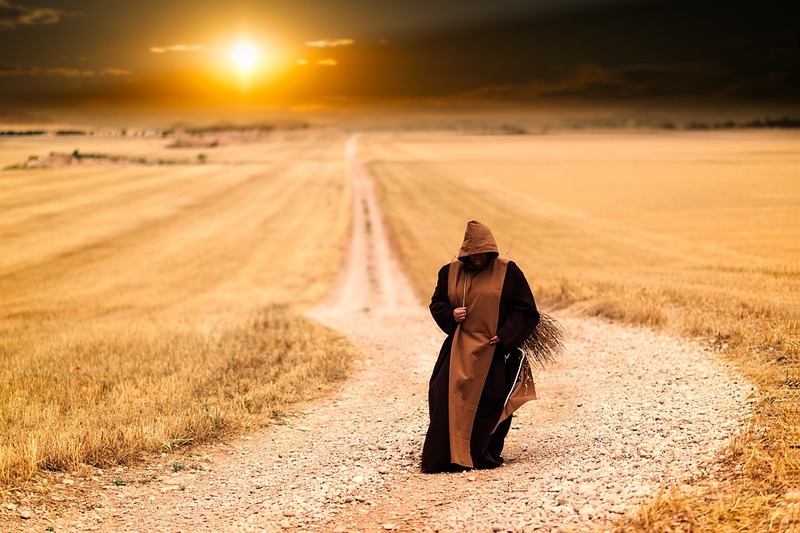 We can keep moving forward on the journey only to find out we have walked round and round and found ourselves right back where we started saying, “Have mercy on me, a sinner.” I am not ready to go into Jerusalem yet. I need to stand by the side of the road with the blind man, I need to climb a sycamore tree with Zaccheus, I need to stand in the temple with the tax collector and beg for mercy. Dr. Buttrick, a Professor at Vanderbilt Divinity School, taught us to proclaim the whole story of salvation and not be limited by the lectionary. But sometimes studying a whole paragraph might be too much. We may need to take it slower and stay at a verse long enough to feel it sink in, forgetting the journey and destination for awhile. St. Paul says the Gospel is so rich we need to sip it. Like communion, savored. Digesting slowly what it means to be humble, until we feel it sink into our thick hearts. It is enough to read, “God, be merciful to me, a sinner”, be changed by the words, and the deeds these words provoke, so if we ever get to Jerusalem, we are ready.